If you’ve been following our posts, you’ll know we’ve been prepping our Aerocabin for a road trip. Bird’s family planned a vacation at Dale Hollow Lake in Tennessee, so we decided to drive from Los Angeles. I’ll be telling most of the story (in excruciating detail with lots of photos), and Bird will pop in to tell you about how the car handled the trip. We set out on Monday morning for Lake Havasu city. As we left town I realized we would be driving by Driftmotion. They rebuilt our turbo, and supplied most of the other parts for our Soarer, so we decided to stop by. They had never seen the car, so of course we demonstrated the top for them. It is only a 5 hour drive to Lake Havasu City, but it took us 12 hours to get there. It seems we had a little bit of an overheating problem. We stopped at an Autozone and to replace our (brand new!) leaky radiator cap which seemed to improve things a little, but every time we stopped the car would get hotter. I would like to mention at this point that the temperature in Arizona this particular day was 108. So it was hard for us to tell if the car was having a real problem or if it was just operating way outside it’s intended environment. Bird’s Note: Here’s what I was thinking through all that… ‘Uh-oh the gauge is reading a tiny bit hotter than normal…Crap…it’s a blown head gasket…but it’s 108…maybe the cooling system just can’t handle 108…or it’s a head gasket…wait, the radiator cap isn’t holding pressure! Fixed It! Arizona welcomed us with a lovely sign! We finally arrived at the house in Arizona, but it was too late to go to the MVD, so we hung out and took some night shots of the Soarer. The plan was to store the Aerocabin in Arizona until we sold it, so we wanted to get it registered there. The plan has changed, but we can go into that in a later post. Tuesday morning we went to the MVD first thing and found out we needed a “Level II” inspection. This isn’t really a big deal, it’s just an official check of the paperwork versus the numbers on the car. The big deal is that there was no one within hours that could do it that day. Thursday was the next time the guy that did it was going to be in town. Since we weren’t going to be able to get the car registered that day we decided to take a closer look at the cooling system. Bird had already had the radiator flushed, but we were worried that it might still be dirty or clogged. We ended up just replacing it, since the old one wasn’t in the best shape. The good news was the shop we had it at could get the part first thing the next morning and they could have it done by 11am. Our friends in Lake Havasu really helped us out driving us around town while our car was in the shop. We would’ve had a tough time getting this all done without them because we only had one car with us! Once we got the car dropped off at the shop there was nothing we could do for the rest of the day, except go out on the lake! Our friends also have a really great boat. We did some swimming and sunbathing, and I jumped in the lake wearing my prescription sunglasses and lost them, an awesome thing to do at the beginning of a road trip. The London Bridge! Really. Google it. Bird’s Note: It’s a diesel too. We got the boat out before the storm! At 9:20am Wednesday we received a call from the mechanic saying that our car was ready. Yay for getting things done early! Now that the car was ready I was determined to get that inspection done so we could register the car and get on the road. Since there was no one in Lake Havasu City that could do it that day, I figured we could make it to anyplace within 3 hours to get the inspection done. After about 30 phone calls I spoke to a Sergeant who said he couldn’t do it today, but he would make some calls and find someone who could. He really came through and found a place we could get the inspection only an hour from where we were. For the inspection, the officer needed to see the export certificate, customs forms, and the bill of lading. Everything checked out and we took the paper he gave us and went to the closest MVD to finish the registration. We paid the registration fee and got our plate! Getting a real plate for the car was a really great feeling, no more temp tags! We’ll have to do something about those holes not lining up. It was already 4:30pm by the time we got this all finished, but we needed to drive some more that day. We were planning on leaving Lake Havasu City sometime on Tuesday and it was already Wednesday afternoon! We made it to Flagstaff and found a cheap hotel that had the biggest flat screen I’ve ever seen in a sub 100 dollar hotel room. Thursday morning we were feeling good and ready to put in some serious miles. We took it slow and stopped to let the car cool off a couple of times but it did seem to be doing better. I think this part of the drive had the most beautiful scenery, and I got a few good shots out the window. While we were on the road we heard from our mechanic in Estonia. The air suspension is installed on our Lada and he’s replaced a bunch of other parts. All it needs now is wheels and a transmission swap and it will be road trip ready! We really love road trips and the Lada was part of our original road trip plan. If you’d like to read more about it check out our Restroadtrip site. We started seeing signs for a car museum at a truck stop Russell’s Truck and Travel Center and decided to check it out. The cars displayed there really were museum quality and they even had a Ford Fairlane 500 Skyliner, the predecessor to our folding hard top. If you find yourself driving the 40 through New Mexico I definitely recommend checking it out. Somewhere in New Mexico our A/C stopped working. We rode windows down during the day and top down at night for the remainder of the trip. The wind noise with the top down is actually very minimal, even at 75 mph, much better than having the windows down. We stopped at a Walmart to get hats to protect from the wind/sun. 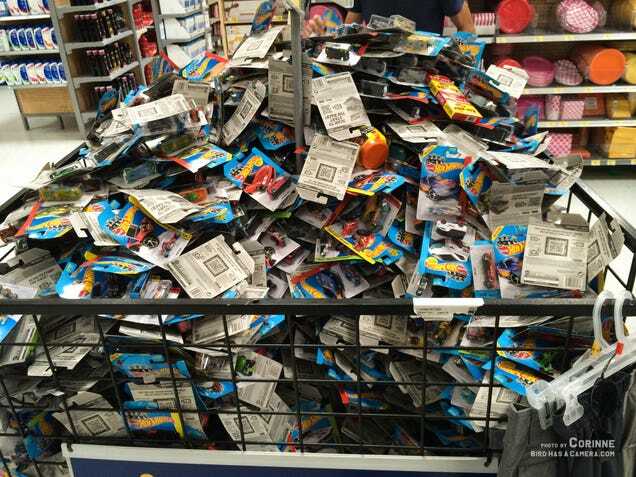 This particular Walmart had an excellent selection of Hot Wheels and we bought about 10 or so. Bird says I can post the picture of him wearing his hat if I post mine, so here we go. I’m hoping the Jalop points gained by the shirt and Hot Wheels makes up for the ridiculous hat that makes me look like I have no hair. We made it to Santa Rosa New Mexico that night. On Friday we left Santa Rosa and crossed into Texas before lunch time. Texas welcomed us with a lovely sign and an asshat parker. I’m from Texas, so I was pretty excited to take Bird to get some real Texas BBQ in Amarillo. 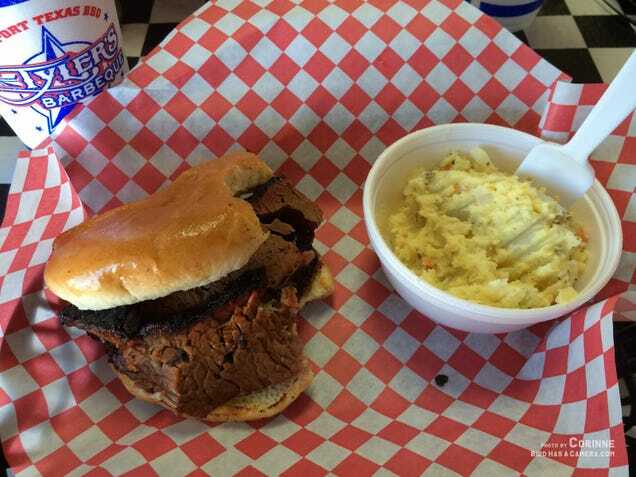 We went to Tyler’s BBQ and had delicious brisket sandwiches, exactly what I was looking for. While in Tyler’s I overheard a kid, having seen our car in the parking lot, wondering how low cars can go over speed bumps. Very carefully…and the Aerocabin isn’t really that low. We made a quick stop at the Cadillac Ranch. We were lucky we didn’t miss it since we didn’t realize we would be passing it. It was pretty cool to see the cars up close. The paint was layered inches thick and the area was littered with spray paint cans. We crossed the border into Oklahoma (Oklahoma did not welcome us with a sign), and decided push on until we got to Oklahoma City. On Saturday morning Bird got to experience the joy of Whataburger breakfast, which I thought was so important that I walked a mile round trip to procure it. There were good parking lots and back roads near our hotel, so I decided it was finally time for me to drive the Soarer. I’ve never driven a RHD car before, and the only manual I’ve driven with any regularity is my Abarth. So I was mostly worried about getting used to the clutch. I didn’t even stall it once! It was actually really easy and shifting with my left hand was not hard at all; the weirdest part is looking left to look in the rearview mirror. Driving on the right side takes a little getting used to center yourself in the lane, but Bird was there to correct me if I went too far left. I felt good enough about driving it that we got on the freeway and started heading out of town. About 30 minutes down the road the freeway came to a nearly complete stop because of an accident up ahead. The car started to heat up when we weren’t moving, so we had to pull over and wait for the traffic to clear. We managed to stop under an overpass, so at least we had some shade. While we were waiting we decided that we should replace the fan clutch. I made some calls and found out that the Autozone distribution center (back in Oklahoma City) had the fan clutch in stock, the woman even went and checked the shelf when I was still on the phone to confirm it was there. So we went back the other way to get to the Autozone. When we pulled up, one of the employees was on a break outside. He is the only person on the whole trip who knew exactly what our car was as soon as he saw it. A minute later one of his friends pulled up and he knew what it was too! He wanted to take a selfie with it because he was sure his friends wouldn’t believe him. Bird replaced the fan clutch in the parking lot and we were on our way again. We decided to try to drive as late as we could that night because we still had 800 miles to go. Because we drove through Arkansas at night we didn’t really see it, but we did smell it. First it smelled very strongly of pine trees, other times it smelled kind of swampy, confirmed by looking at the map to see it was kind of swampy, it also smelled sulfery and skunky at times. When you’re driving in the dark with the top down, you really smell the scenery. There were also quite a few deer, but luckily they were all off the road. We stopped every hour and a half or so to stretch our legs and get some caffeine. I imagine we experienced what it would have been like to drive the same car through this part of the country in 1989. At one gas station we stopped at there were quite a few people there and no one would make eye contact. It was weird. And it was a shame because there were some pretty cool trucks I would’ve liked pictures of. We got to see a beautiful sunrise in Arkansas on Sunday morning, and then the car started getting hot again and we needed to find a place to sleep. I was worried about being able to find a place where we could get an early check in so that we could get enough sleep to set out around sunset. We pulled into a Days Inn in West Memphis and they really hooked us up. They had a room that had already been cleaned and the woman at the front desk even went online to find us a coupon! I think she felt sorry for me because I looked pretty wind-blown and tired. So we were able to check in at 8am and get a full day’s sleep. We woke up around 5pm Sunday night, got some dinner at Cracker Barrel and then hit the road. We made it into Tennessee and to just East of Memphis when the car started running rough for the first time. Tennessee welcomed us with a sign right in the middle of the bridge over the Mississippi River! We decided we couldn’t safely drive it any further and called Bird’s family at the lake to let them know we had made it as far as we could. Bird’s dad and one of his cousins decided to drive his dad’s truck overnight to pick us up in the morning. At this point I was honestly relieved that we could confirm the blown head gasket. I’m excited to have some time away from the phrase “I think it’s a blown head gasket.” The back and forth was driving me a little crazy. Bird’s Note: Definitely a blown head gasket. At 6am Monday we got a call from Bird’s dad saying that they were almost there. Since it was still too early to get a trailer we went to Cracker Barrel (again!) for breakfast. Then we picked up a trailer, loaded the Aerocabin on and began the final 5 hour drive in the truck. We finally made it to the lake and Bird’s family was so happy to see us. We went tubing and exploring on the waverunners and had some great meals and family time. On Tuesday we drove 2 more hours to Bird’s grandparents house and dropped off the Aerocabin. Kentucky was the last state to welcome us. I had to get back for work so I flew back on Thursday and Bird stayed behind to work on the car. Bird’s grandparents have a pretty sweet garage with a built in beam for hoisting the engine, so he was all set. Bird’s Note: I’m working on a detailed post about the teardown. Be warned the images of the inside of the engine are kind of graphic…it can be fixed though. We’ll solve the problem permanently with a metal head gasket and ARP head studs. All it will take is some time at the machine shop and another call to Driftmotion. Their rebuilt turbo performed flawlessly, and they’ve been a great source of information for us as well as many other 7M owners. Thanks for making it all the way to the end! There are even more pictures on Bird’s website if you want to check them out. We are both home now and we’ll be going back to Kentucky in a few weeks to get the car roadworthy again. This post originally appeared on Oppositelock.